In the summer of Star Wars and Son of Sam, a Long Island schoolgirl is found gruesomely murdered. A local prosecutor turns a troubled teenager known as Joey T. from a suspect to a star witness in the case, putting away a high school football star who claimed to be innocent. Forty years later, Joey T. has risen to chief of police, but there's a trail of a dozen dead women that reaches from Brooklyn across Long Island, along the Sunrise Highway, and it's possible that his actions actually enabled a killer. That's when Lourdes Robles, a relentless young Latina detective for the NYPD, steps in to track the serial killer. She discovers a deep and sinister web of connections between the victims and some of the most powerful political figures in the region, including Joey T. himself. Now Lourdes not only has to catch a killer, but maybe dismantle an entire system that's protected him, possibly at the cost of her own life. "Peter Blauner has created one of the most memorable psychopaths since Hannibal Lecter." "The prose is economical and precise, the setting well drawn and the characters real enough to give you a chill the next time you cruise past a police car... [Blauner] has produced only seven previous novels since he helped set the standard for debut crime novels with Slow Motion Riot in 1992. But all of them, including this one, have been worth waiting for." "First rate suspense, with a soupçon of horror in the Hannibal Lecter vein. On sale today. You won’t be disappointed." "What James Ellroy did to L.A. in L.A. Confidential, Peter Blauner does to L.I. in his new thriller, Sunrise Highway. [A] master class in how to write a thriller.... Blauner crafts tight scenes that hum with tension and propel the reader forward. Characters major and minor are distinctive, and keenly observed details—the paper napkins, the cooks shouting in Spanish and the stools that seem about to tip at a popular chain restaurant—create a palpable sense of place." "Nifty... Blauner keep[s] a tight focus on his regional setting." Starred Review: "Bestseller Blauner's excellent sequel...connects two strong story lines—the discovery of a body washed up on a beach in Far Rockaway, Queens, and a trail of murdered women along Long Island's Route 27 (aka Sunrise Highway) that dates back to 1977.... The intertwining narratives—Robles's investigation and Tolliver's shadowy backstory—make for an action-packed and plot twist-laden thriller. Exploring such subjects as police corruption, misogyny, and racism, this is a page-turner of the highest order." Starred Review: "A string of murders on Long Island leads a New York cop into a web of corrupt police officers and politicians in this first-rate suspense novel.... Blauner excels with strong, realistic characters, believable police work, and smart, propulsive dialogue. A highly readable and unnervingly close-to-home view of power in the service of evil." 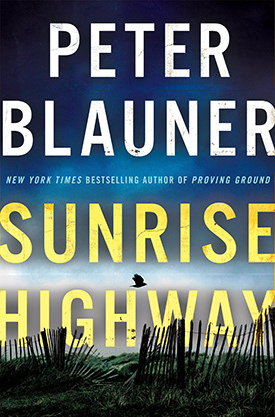 "Peter Blauner has crafted a sumptuously elegant tale that’s the best dark thriller this side of James Ellroy as channeled through the classic film noir Chinatown or HBO’s sterling first season of True Detective.... Reminiscent in all the right ways of Roderick Thorpe’s classic The Detective, Sunrise Highway is a crime thriller extraordinaire, its pitch-perfect pacing equaled only by its superb characterizations." "a brilliant novel... Blauner’s prose is classic noir... The tension of this style of storytelling is broken with perfect moments of dark humor. This is visceral writing that is impossible to put down." "Sunrise Highway is a terrifying and infuriating reading experience that will spike your blood pressure for hundreds of pages." "If you've sworn off serial killers, do yourself a favor and make an exception. Blauner's richly evoked characters come to life in a narrative that weaves a web between the past and the present. Just as important as the vivid characters is his use of language, poetic and often surprising. It's a compelling novel, but try not to turn the pages too quickly. His writing is worth savoring."